Beyond-Bedding: Accelerate Your Babies Brain Development! 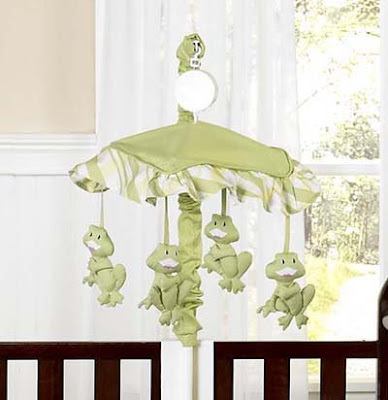 There is so much more to a crib mobile than just being a decorative object that hangs over your babies crib. They are stimulating, entertaining and calming. Who would think such a simple object could have so many purposes?!? Your baby spends quite a bit of time in their crib, hopefully sleeping, but when they’re not asleep they are observing and taking in their surroundings while processing and storing information. Having a colorful mobile that plays music can in fact activate, excite, and enhance the development of your babies’ brain. Choosing the crib mobile is the fun part! There are so many variations; you can easily pick a stylish mobile that flows with the existing room décor. Since newborns can’t distinguish colors, start out with a simple mobile with two or three dark colors. As your baby grows switch the mobile to one that has brighter colors, patterns, and lots of fun attachments. It is a good idea to buy a crib mobile that plays music; a soothing melody can calm and relax your baby making bedtime easier for the both of you. Remember a combination of sight and sound will accelerate your baby’s brain development to the fullest. After all is said and done, make this a fun experience and of course choose something that you enjoy looking at as well!